The United States leads the world in potato chip manufacturing due to the high-quality of U.S. chipping potatoes. Companies around the world can access these same high-quality chipping potatoes for processing in their facilities. U.S. chipping potatoes offer buyers a wide variety, as well as year-round availability thanks to the different growing regions in the United States. Potatoes USA also offers support for U.S. customers including variety and supplier information; technical assistance during shipping, receiving and processing; and a chipping-potato samples program. U.S. quality begins with top quality certified seed planted in the U.S.' fertile soil and grown in a climate optimal for potato growing. U.S. potato growers take care to use the best production practices for a healthy crop. Careful harvesting, proper handling, and modern equipment all help to maintain the high-quality of chipping potatoes from the field to the manufacturing plant. Proper storage of chipping varieties is vitally important. Potato storage in the United States consists of modern facilities using the latest technologies. This maximizes the storage life span of the potatoes. As with all potatoes grown in the United States, U.S. chipping potatoes are inspected, sorted and graded using strict U.S. industry standards in keeping with requirements of the United States Department of Agriculture (USDA). U.S. growers harvest potatoes all four seasons of the year, with the larger portion of the crop harvested in the fall from September through November. Potatoes not sent to market immediately are put in storage and kept throughout the remainder of the marketing season. Because U.S. growers plant and harvest chipping potatoes throughout the country and year-round, there are potatoes available for export all year. 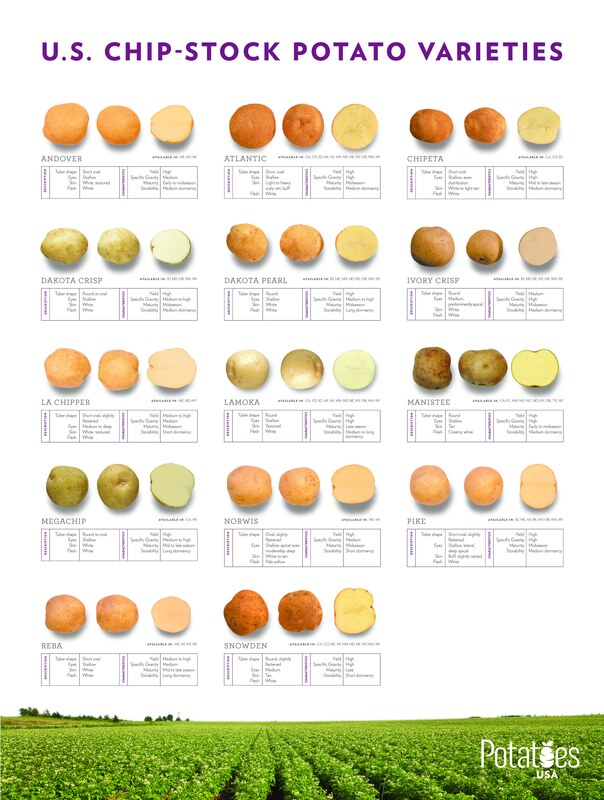 The different potato varieties that U.S. growers produce represent a breadth of storage, shipping and chipping characteristic. So, based on your operational needs, you'll find the U.S. potato variety that best meets them.